The Force has returned and it was glorious! I will add no spoilers so those that haven't seen it can have a chance to enjoy it with all the surprises intact. We get lots of old faces from Episodes 4-6. But even with old friends, this is a new story with a fresh slate of characters and those newcomers did a remarkable job. First, we have the new villain by the name of Kylo Ren (Adam Driver), the wannabe Darth Vader with a secret past. Next is Finn (John Boyega), a person trying to figure out who he really is when he meets Rey (Daisey Ridley). Rey has a secret past, surrounded by much speculation. She is a character I enjoyed and am excited to see where her destiny takes her. BB-8, the ball droid seen in the movie trailers is one you will really love as well. Again I will refrain from any spoilers but will try to add what I can without doing so. 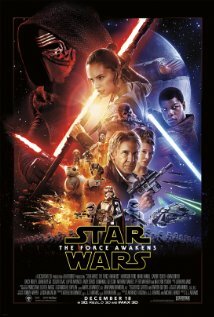 The Force Awakens was a story similar to another episode but with its own unique twists and flavor. There is classic Star Wars comedy and action throughout. I never felt that Force Awakens slowed down or was dull, even for a second. Each new character built upon one another to bring it all together. The Force was mentioned, of course and to this day the Dark Side is still on top, unfortunately. There is still no balance and Luke seems to remain the only hope of restoring light to the galaxy. We see a new villain above Kylo Ren as well, Supreme Leader Snoke (Andy Serkis), an evil being that takes the place of the Emperor from the original trilogy. Seeing The Force Awakens will be the greatest way to end 2015. It brought back the joy and memories from the original trilogy and played on all my emotions. I'm a sucker for lightsaber duels and you will see that for certain as well, along with a wide variety of other action scenes. Waiting for the next movie will be cruel indeed.